In the movie "Heartbreak Ridge", Clint Eastwood says his Marines are taught to "Improvise, Adapt, and Overcome". You gotta love the United States Marines and of course, Clint Eastwood. So if they don't mind, we are going to borrow that phrase because that's what we had to do when we came up against a tough slab lifting job this past weekend. Here at Alchemy-Spetec, we do have a 20' trailer rig with a PHX-40 pump in it. 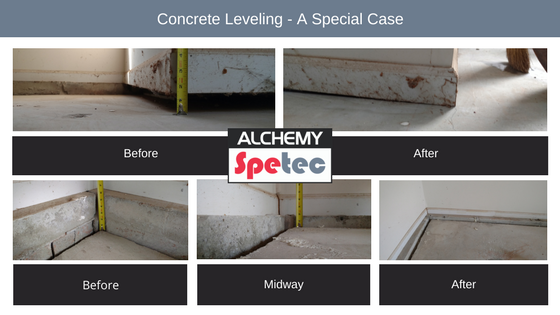 We use it for slab lifting demos, training events and product testing. This past weekend we used it to help out a family in need. Their home was built in the 1990s and the garage was built on fill dirt surrounded by a concrete block wall. Within a year of moving in, the garage slab settled several inches indicating poor compacted fill dirt. The builder wouldn't address it, disappeared, and left this family with a sloping garage slab they've had ever since. It had since become worse and something had to be done. A site evaluation told us that this was going to be no ordinary slab lift. In some areas there were voids over a foot deep beneath the slab! From the outside, it was easy to see where the CMU (concrete masonry unit a.k.a. concrete block) wall was buckling outwards. Slab lifting with polyurethane exerts lateral forces too so I was worried about pushing the wall out further (which in turn would cause a collapse of the garage slab, wall, and everything else attached). This might have been a job to walk away from, but I thought there might be a way to do it. 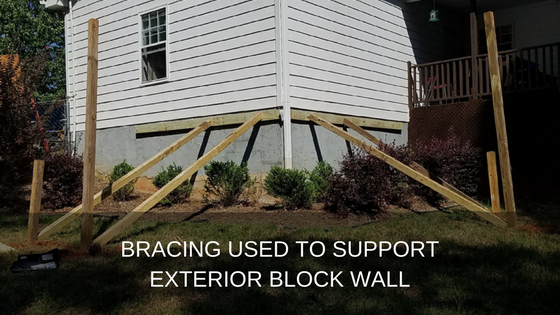 First we installed bracing on the exterior of the CMU block wall to offer some support against the lateral forces likely to be exerted. Once that was completed we began injecting in a grid with AP Lift 430, starting at the lowest point and working our way out from there. I won't lie, this job was taking a lot of material because of the voids and the amount of lift required. There was a lot of creaking and grinding going on as the slab was raising. At one point we stopped and I decided to try something to give the wall more strength. Inside the garage there was a cap block that ran along the top of the CMUs. Drilling through the cap block, I was able to inject and fill the CMU wall cavities with the AP Lift 430, thereby tying those courses of block together with a polymer column. we raised the interior slab up over 4 inches. So next time you see a tough looking slab lift, ask yourself if you're going to just walk away or whether you're going to step up to the plate. Make Clint proud!